The Naturescape is on Lake Nokomis in Minneapolis, 5001 East Lake Nokomis Parkway. Meet at the hillside garden on the north east corner, (take 28th Ave S to 50th street and head a couple blocks towards lake) come early with a picnic summer or to enjoy a swim! This is an opportunity for the Wild Ones to learn about the Nokomis Naturescape, a 4 acre native planting installed in 1998, and enjoy what is in bloom now. there will be a walking tour followed by a hands on gardening session. This is also a great opportunity for park patrons to learn more about the Wild Ones mission. Bring with you your favorite gardening tools such as spade and small shovel. Gloves are recommended. 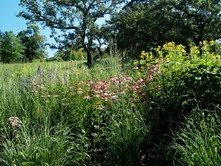 We will be planting Little Bluestem and Rough Blazing Star. We will be watering the newly planted with water drawn from the lake.